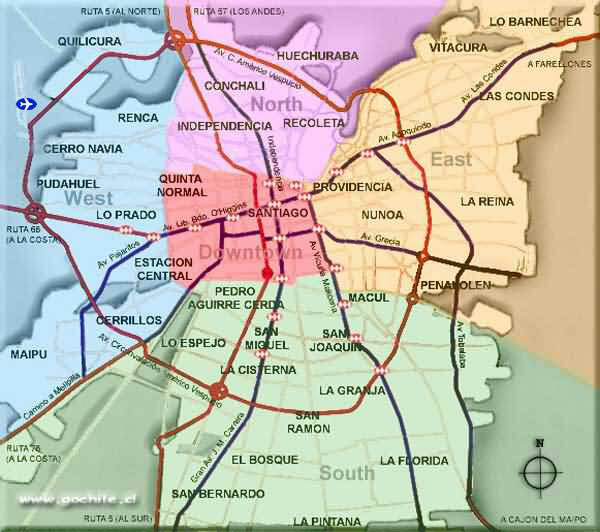 The hotel is in the Las Condes area of metropolitan Santiago and my family lives there as well. Las Condes is in the northeast quadrant of the map on the left. Our hotel is just east of where the new beltway intersects with Avenida Apoquindo. Our cousins live further to the northeast. The hotel is a short walk to the subway line that will take us downtown. I don't think I will want to drive in the downtown area. There are small busses here that are called Micros. I call them suicidal. They seem to compete with each other for passengers and if you are in their way, they may just run you down. The rental car agent warned us about them when we picked up the car. We had some close calls the last time we visited Santiago. On the other hand, I had my passport wallet lifted from my backpack in the subway in1999 (fortunately it was found and returned within hours). When we got settled into the hotel and Sam Kaufman left, we decided to go for a walk around the area. That was a short lived idea as we were both exhausted. We both tried to sleep on the flight down with limited success so we both took a nap and felt ready for a get together with the cousins. A get together with the Chilean cousins is an experience. 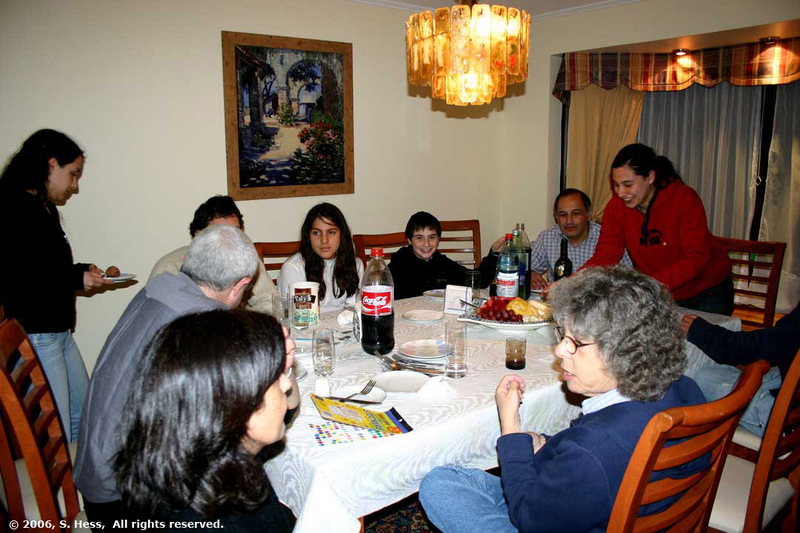 It is an experience because there are 11 cousins counting spouses and two generations. and they are quite animated when they get together. Another reason for calling it an experience is that the meal did not begin until about 9 p.m., a time when Susie and I are generally thinking about going to bed. Even though this was a weekend and the cousins had school and work to look forward to, we kept going to well past 11. Considering the last 24 hours, we had no problems falling asleep. A few of the cousins having dessert.